2019 Swap N Hop Intro post - #5!!!!! Well friends - here we are again - time for another intro for another partner for the Swap N Hop. It's like the 1st day of school for me - filled with so much excitement, wonder as to what I'll send and receive, what we'll end up making....just an EXCITING time of the year for me. I find myself posting my newest pieces on Instagram, as I'm working to build my following there and hopefully open up some new business opportunities. FINALLY! I have a prettied up Brand, new biz cards, new sign, new earring cards...the hole bit! I've enjoyed revamping my brand to make it more....elegant. I'm hoping to step up my game this year, by introducing a higher end line, as well as my regular stuffs. I'm hoping to reach a little higher price point, customer. So - we'll see how that goes. It's gonna be a risk...but hopefully one that will pay off! 1. 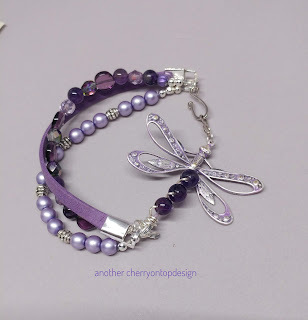 Why or how did you get started in making jewelry? I got into jewelry by way of a craft show. I purchased a beautiful necklace for a family member for $38. The next week, I saw the same vendor at another show and mentioned that I had purchased a similar piece the week before. Her response was that they "got some more in". I thought "I thought you made it"? A few days later, while at a big box store, I see the same pendant for $4.99. 2. 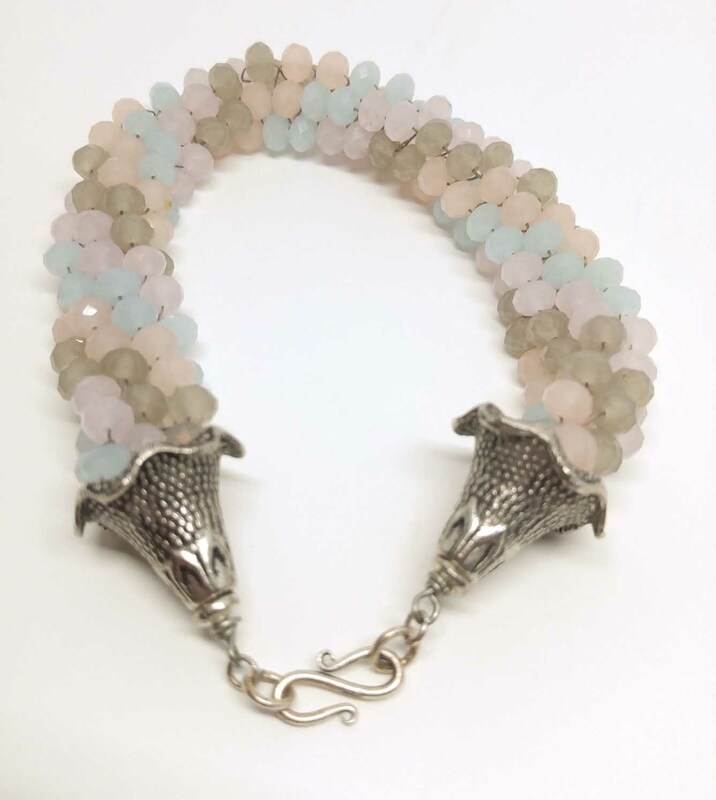 What style(s) of jewelry do you like to make? It's really important to me that pieces are versatile, so that you can wear it with many outfits vs just 1 piece in your wardrobe. I love color and I'm trying to start incorporating other materials in to my typical type pieces. For example: Using fish leather in the necklace on the right. 3. What materials do you prefer to use (and which ones do you avoid)? Generally, I avoid seed beads and anything that generally just doesn't appeal to me (seriously, no aventurine). 4. Which techniques do you prefer (and are there any that you don't like)? I like to make many styles of jewelry. I consider myself a stringer, first and foremost. 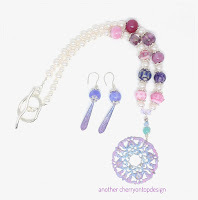 I've done pearl knotting, kumihimo, wire crochet, play with resin, some painting and some basic wire work. I don't do bead weaving of any sort or anything involving heat. So, no soldering, lampworking or anything like that....I sure love the pieces - just don't make them. 5. What colors do you use most, and which do you run screaming from? I've realized that making pieces with 1 color are REALLY tough for me. Someone suggested I make a black necklace. I didn't (and still don't know) where to start. I want to add color! Can't win 'em, all right? - I get to babysit 2 of my favorite little people from time to time - they're the BEST! - I love PJs and fun socks - I wear them most of the day....every day. - I love to laugh.....alot. - I love to plan an awesome party! To be sure you don’t miss out on any of my crazy adventures, you can sign up to follow my blog by email or news servers using the links in the right column of my page. 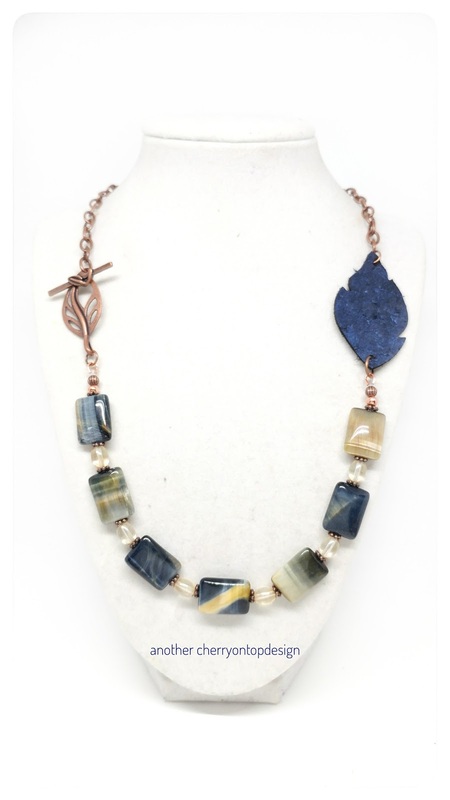 You can also follow me on Instagram or Facebook get updates about blog posts, my latest jewelry designs, show schedule, and other happenings! 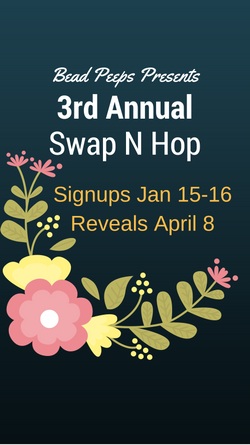 Well, another April - and another Swap N Hop! This year, I had Inge Van Roos and I was one SPOILED girl! Holy CANOLI! Inge makes her own lampwork beads and absolutely OVERWHELMED me with not 1....not 2...but 3! different color schemes. Blue/greens (YES! She made that bead with the goldfish!!! 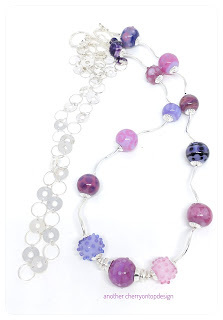 ), rainbow beads and my FAVORITE the pink/purple family. Y'all - I could HARDLY choose which palate to go with! I've got some big plans for the rainbows.... but for Hop purposes - I wanted to go with pinks/purples. 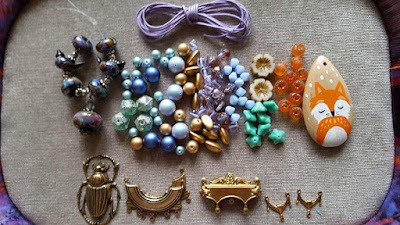 Click to enlarge and see the details in all these beads! Dang girl!! If you've followed my challenge adventures, you know that I LOVE to give myself an extra challenge within a challenge. This year, I decided that I wanted to make a piece that could be worn at least 2 different ways. In addition, I've noticed a real trend in jewelry with using curves.... be it a false collar with chain or using seed beads to create swags... I REALLY wanted to incorporate this somehow into my own piece. So...here we are! Y'all - I picked through all the beads that she sent and pulled all the ones that I LOVED out *y'all LOOK at the details on these beads! * and put them on the strand with the wavy tubes. 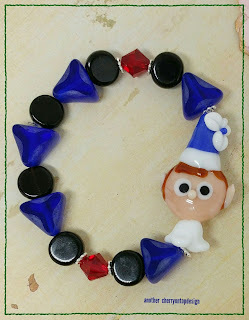 It was tres-importante to keep the lampwork beads the focus. 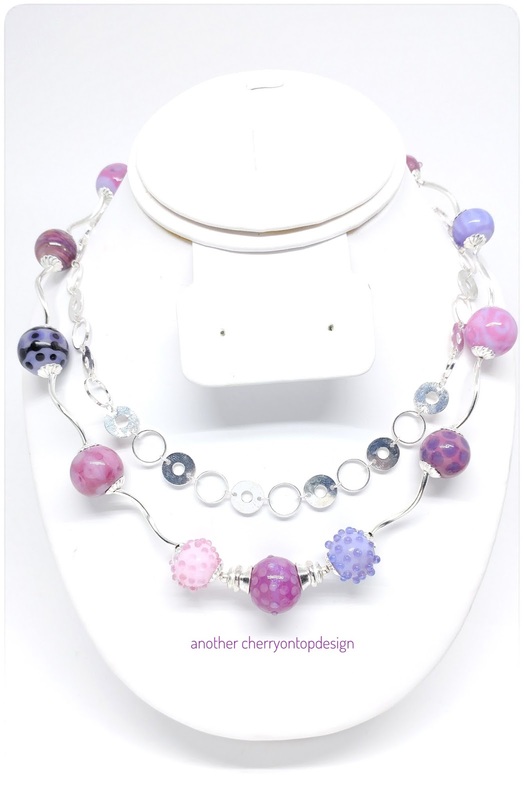 The chain was there to enhance the lampworks. As for the challenge within a challenge - I made this piece such that I can wear it short OR I can wear it long. By using the round links, as connectors, it makes sense to see them in the long version. I can wear whichever strand I'd like in the front. I kinda love it! Ok - I REALLY love it! 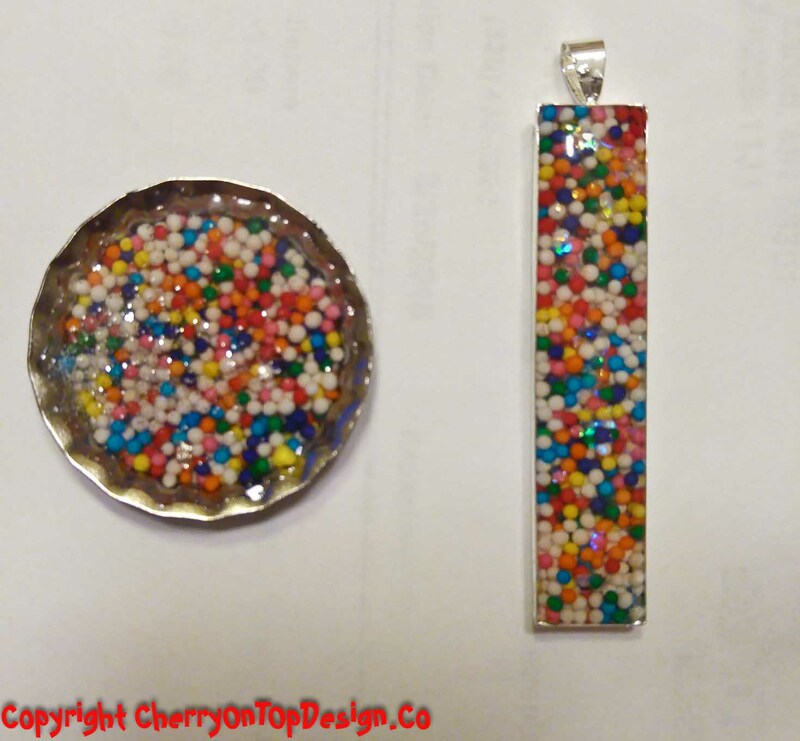 Click to enlarge and see these CRAZY COOL beads! AND.... I also put together another set with her pinks and purples. This one is pretty and classic. 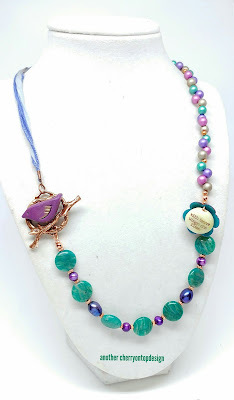 I used Swarovski pearls and added in a GORG pendant. *** The story of the pendant is that I created it at the Twin Cities Bead Bazaar, during "Coffee with Candie". We had the chance to play with the new pearl Vintaj patina paints. EEK! I REALLY loved how this pendant came out. 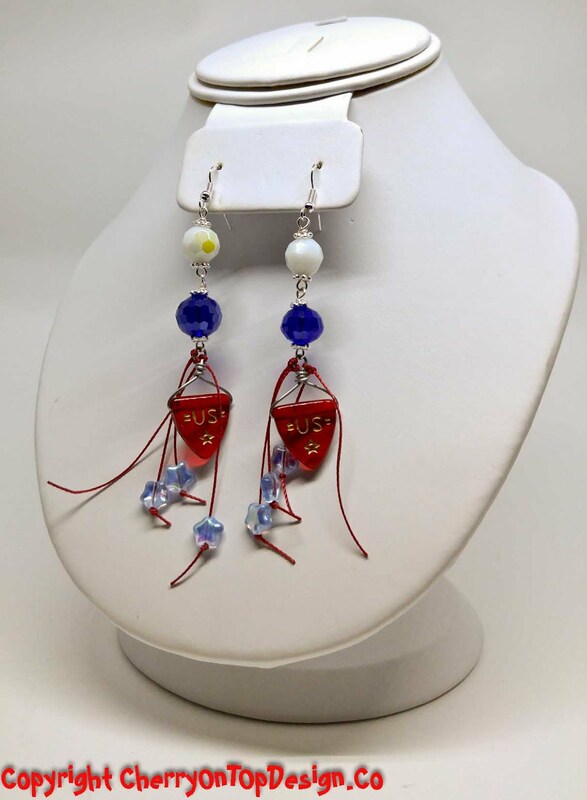 A few weeks later, I ordered the paints for myself and used them to paint the dangles on the earrings that you see, as well. THANK YOU, Inge! I can't WAIT to see what you've made! 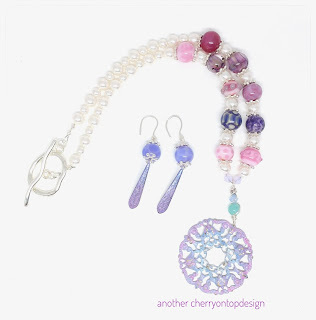 I like to make jewelry that can dress up any outfit (I like to say from ho-hum to SHA-ZAM!). It's also really important to me that pieces are versatile, so that you can wear it with many outfits vs just 1 piece in your wardrobe. Typically, I'll use anything from handcrafted lampwork beads, to Swarovski pearls and crystal, to bits and bobs of fabric, to beads purchased at big box stores, beads from tradeshows and anything else I find interesting. I like things that are unique - be it in color, style, size, shape, sparkle...something interesting. AND I'm kinda obsessed with handmade beads, right now. 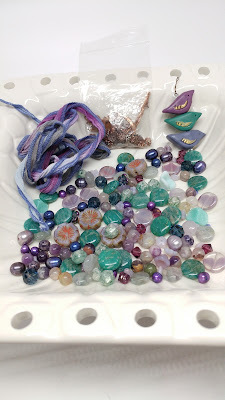 Generally, I avoid seed beads, earthy/rustic colors and anything that generally just doesn't appeal to me (seriously, no aventurine). 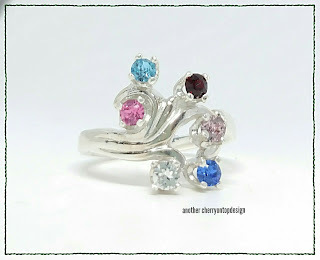 I like to make many styles of jewelry. I consider myself a stringer, first and foremost. 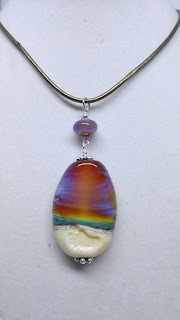 I've done pearl knotting, kumihimo, wire crochet, play with resin, some painting and some basic wire work. 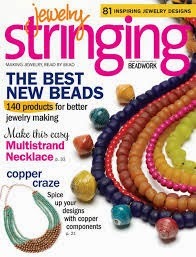 I've done some bead weaving, but it's certainly NOT something I'm able to do without a pattern or make up. To be sure you don’t miss out on any of my crazy adventures, you can sign up to follow my blog by email or news servers using the links in the right column of my page. You can also follow me on Facebook get updates about blog posts, my latest jewelry designs, show schedule, and other happenings! Ghosts, Ravens and ZomBEEs! Oh my! After a small hiatus, I'm back for a new challenge and a little fun! 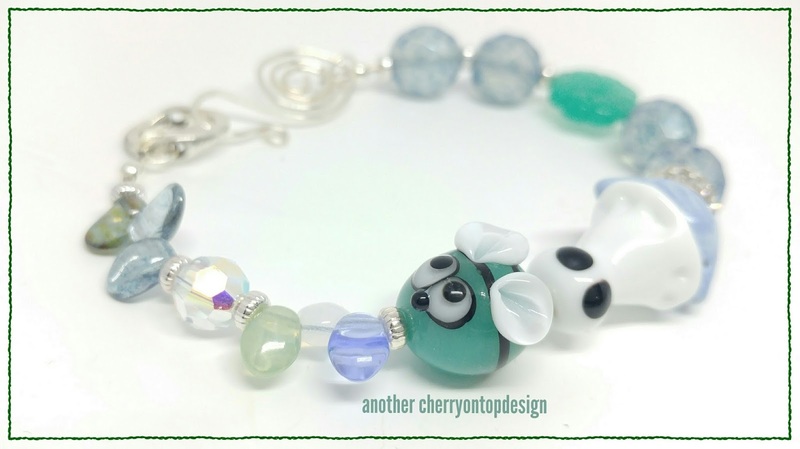 A few weeks ago, I was sent a DARLING little bead.... a zomBEE! Isn't that ADORABLE made by the outstanding - Laney Mead. 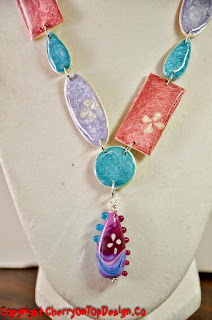 It's part of the Art Elements Blog Hop and I'm SO EXCITED!! This is the first time I've played along with the Art Elements gals and it was SUCH an adventure! Yeah - it just didn't do what I wanted it to do. 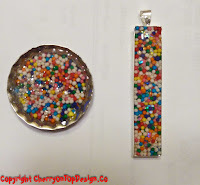 I ended up breaking a bead (I nearly cried) and that made me COMPLETELY revise what I had planned to do. SO - the idea of making an adorable talisman with the zomBEE and some other adorable themed beads was out de door. I struggled getting the black I have to work.... so I went for "pretty" zomBEE...if that exists. LOL! Instead, I decided to go with a sweet little ghost (which was made by Val Moser), a "raven" (Bo Hulley) and my sweet zomBEE (Laney Mead). I added a flower (because bee's need flowers, right? 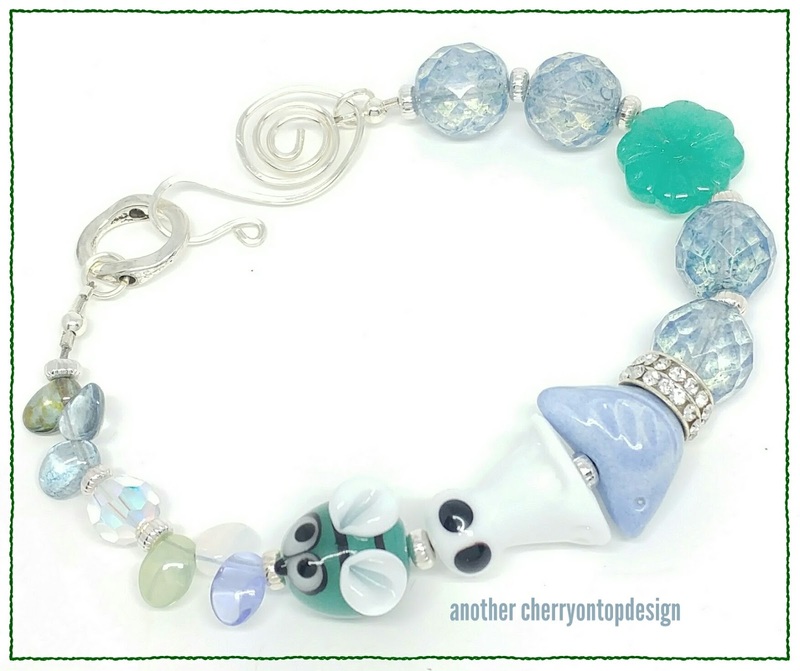 ), some GORG blue czech beads, some *expensive* czech petals and a custom made silver clasp. (I like to challenge myself to do something new to me, whenever I partake in a challenge - so the clasp was my 'new to me' challenge). I do love this piece and I'm quite proud of it. What do YOU think? Yes, it's bright and cheerful. Yes...it's a little more "fancy" than usual... but I kinda love it. THANK YOU Laney Mead and the Art Elements team! I had a BLAST, was stretched and ended up with a pretty great piece. (If I do say so, myself ;) ) Check out every one's pieces, too! 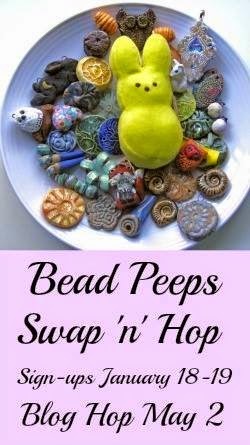 2017 3rd Annual Bead Peeps Swap N Hop Reveals!! This year, my partner was the incredible - the amazing - the outstanding - Christina Marie Hickman of Vintagetreasturesjewelry.blogspot.com. I've had an awesome time getting to know her, laughing together, exploring our love of glass birds and learning new things from her. It's been GREAT to have her! 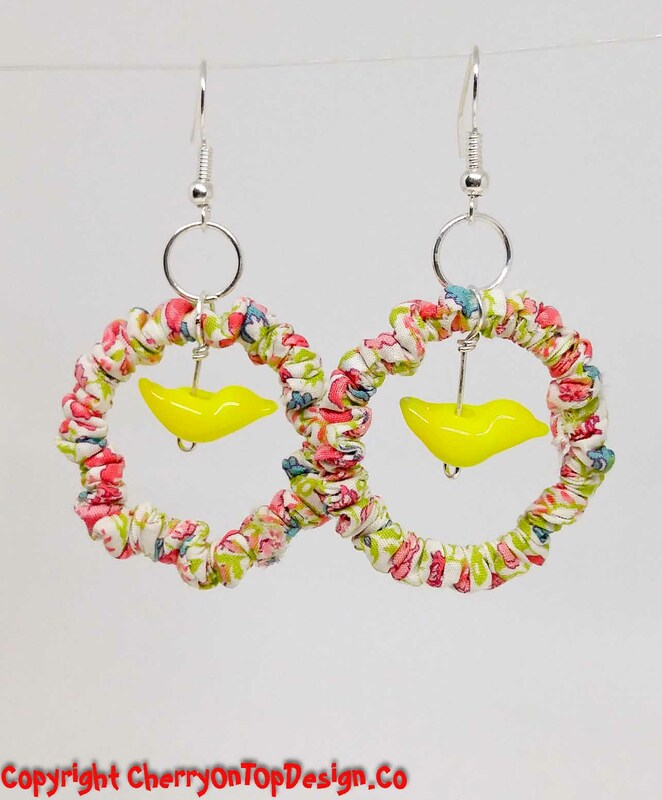 And finally - I made this sweet, little earrings. 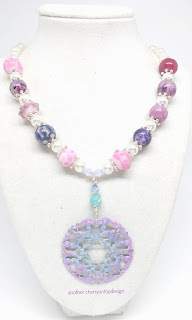 I used some Alexandrite (the color changes from light purple to light blue depending on the light), lampwork ruffles, and many of the beads that Christina sent. 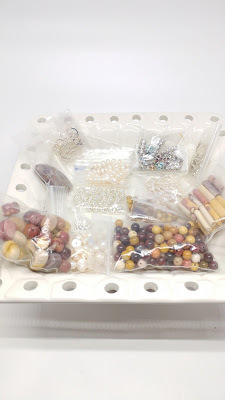 I added a few Czech beads, but otherwise, mostly the goodies she sent. I LOVE them! ANNNNNND I did make a twist piece. I decided that I wanted to try my hand at using the fox pendant. I don't use orange a whole lot, but I LOVE that little pendant. 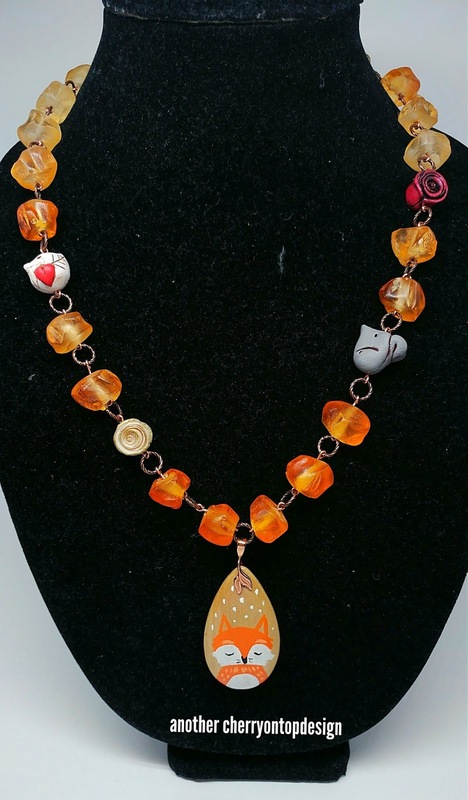 So, this piece features the SummerWindArts fox pendant, acrylic ombre orange beads, UnkamenSupplies copper twisted rings, BeadyLittleBunny clay roses and bird, Humblebeads clay squirrel and some glorious copper chain. I've never put together this kind of piece before - one that really is thematic, in terms of being a woodland animal piece. But it's cute, right!? Can't wait to wear it! SO that's what I've made. I hope you enjoyed my pieces - I'd love to hear what you think and PLEASE check out my friends below, who worked very hard to make gorgeous pieces, as well. Partner Intro - Woot woot! Hey Y'all - So, while it appears I've been a little slacking in my blogging, I've really been having a rough few weeks. I'm thankful I've come through them - still have lots to deal with - but that's life, isn't it? Stress is tough on me, I tend to kinda crash out from my feeling well, to feelin' crumby. But, I'm surviving and for that - I'm thankful. SO - on to the great stuff! 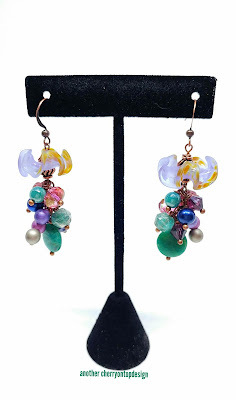 This year, my partner is Christina Marie Hickman of http://vintagetreasuresjewelry.blogspot.com/ . It's been SO INCREDIBLE to get to know her. It's like we were old friends or something. One of the crazier things, I realized AFTER we'd been paired and talking for a bit, was that - had my mother had HER way....I'd have been Kristina Marie...not Linda. LOL We have had some good chats and I look forward to continuing to get to know her. I love her sense of humor. She's a great gal to be partnered with and I'm so thankful that I had chance to have her! On to what we sent each other. 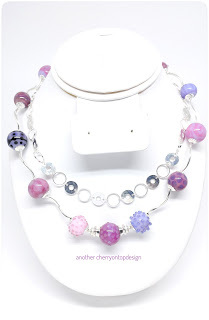 I started with 2 pieces for her.....1 set of lampwork beads and 1 pendant. I had REALLY hoped to get a great package together and focus on the fox, more than the lampwork - but I just couldn't find things I really liked, to go with it. 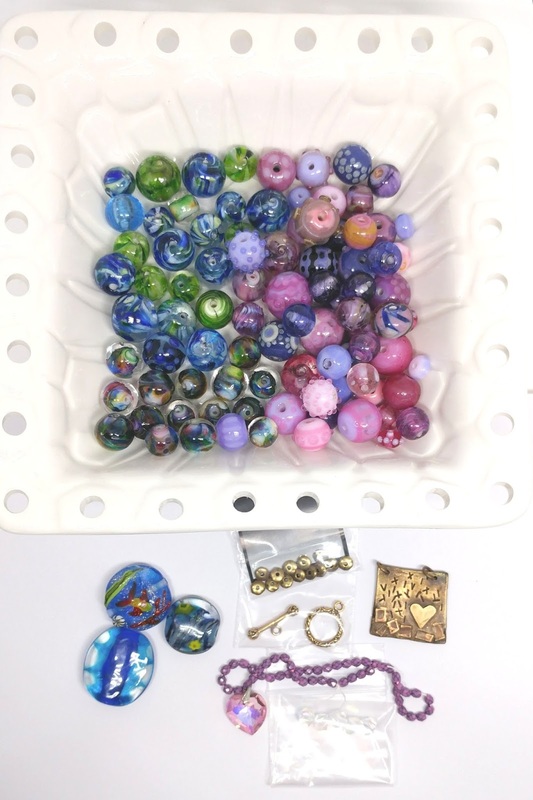 I wanted to challenge Christina, because she said that she doesn't work with beads bigger than 10mm, so my goal was to get her some bigmamajammas, just didn't happen. 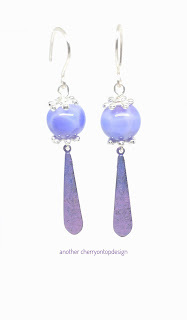 She, also, wanted to work with purples - which I was proud were part of the lampwork set. Her talk of nature walks really inspired me to want to get her things that she might see out and about...which is where the SummerWindArts fox came from, and the birds from the lampwork set. Notice anything similar? Birds? Color palate? LOL! She sent swap things and stash goodies, too! I was SPOILED! She found out I love mookaite and happened to have some that she wasn't going to use - so she sent it to me! I drooled all over the bags and had to use a wet wipe to clean 'em up. Also, pearls, sparklies, spacers...all kinds of goodies. My SWAP goodies included czech glass, humblebeads birds, hand dyed silk, russian amazonite, Swarovski and a whole bunch of other yummies! I'm SO EXCITED! Check back April 8 to see what we both made! be sure you don’t miss out on any of my crazy adventures, you can sign up to follow my blog by email or news servers using the links in the right column of my page. You can also follow me on Instagram get updates about blog posts, my latest jewelry designs, show schedule, and other happenings! 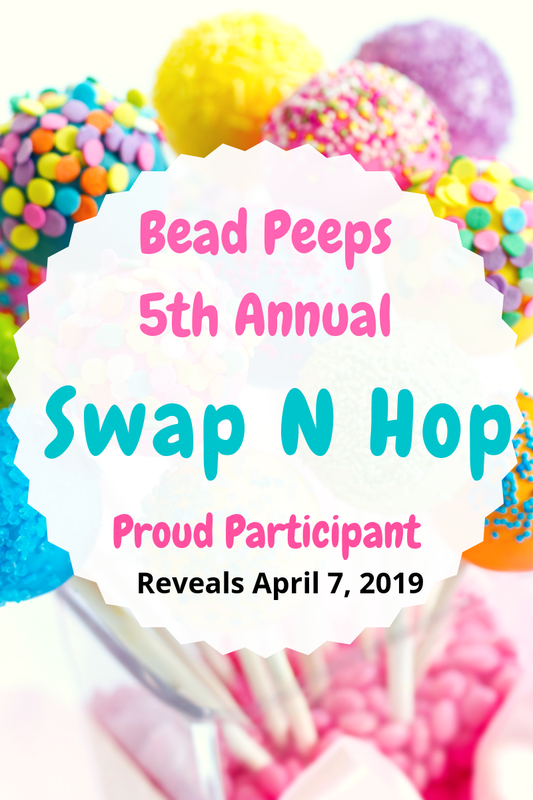 Bead Peeps Swap N Hop Intro #3! 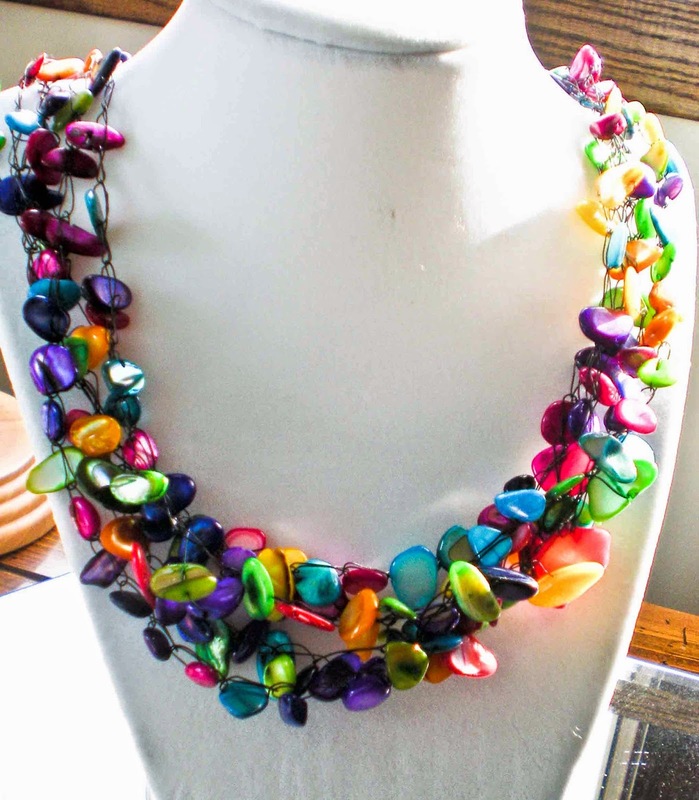 My new cocktail line is "Bold, Bright, Classic Jewelry for Original, One-of-a-Kind Women". =) I like to make jewelry that can dress up any outfit (I like to say from ho-hum to SHA-ZAM!). It's also really important to me that pieces are versatile, so that you can wear it with many outfits vs just 1 piece in your wardrobe. 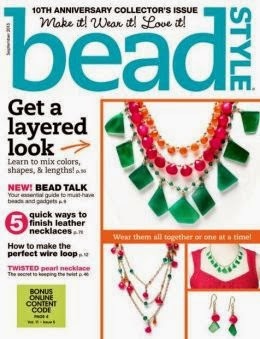 - I've got my first tutorial coming out in Beadwork magazine, this summer! My 4th publishing....eek! - I now have a "dream client" LOL! To be sure you don’t miss out on any of my crazy adventures, you can sign up to follow my blog by email or news servers using the links in the right column of my page. You can also follow me on Facebook get updates about blog posts, see my latest creations, show schedule, and other happenings! This year was an interesting year for me, in terms of gifts. It seems like the folks I buy for - all magically had something come up in a beading group somewhere - that reminded me of them. 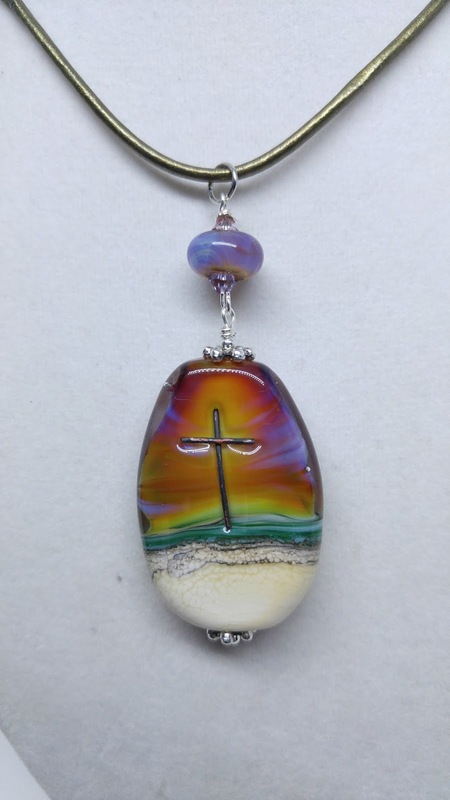 So, the first purchase was a BEAUTIFUL glass and metal cross, focal bead. I purchased it from Jennifer Jennings - so does this awesome beads. She also adds a footprint on the back of the bead - making it seem like the poem, footprints in the sand. Just a REALLY cool concept and CLEARLY her trademark. I bought it for my cousin, who was laid off earlier last year. It was a *complete* shock. She had no clue it was coming *as usual I guess* and was just stunned. So, I bought the bead to remind her that even in the storms - God is still there - holding her up and standing strong. I put the bead on some leather I won from Leather Cord USA and happened to have another spacer bead that matched perfectly to her focal. Can't wait for y'all to see the bracelet I made for her mom! OOoooOO! If you know me, you know that I'm a HUGE Olympic JUNKIE! I watch as much as possible! I mean seriously - how often do we get to watch diving, synchronized swimming, rhythmic gymnastics AND Michael Phelps all in 1 week?! Yeah - silence. So, when Melissa Trudinger proposed doing a piece that honors this 1 in 4 year wonderment, I was IN! Now, lemme be honest. I have ordered some other pieces that when they come - will be going in to a another piece - but for now.... THESE gems are some of my favoritest pieces of USA. (Btw - I'm SUCH a freak that my family bought me mittens with "GO" and "USA" on each hand). I tried something a little different - adding in some cording with the stars, which I think add just a little pizzazz. I'm still working on my earrings - in terms of upping the ante - and not just making them.... simple and boring - if that makes sense. SO - here they are! =) Enjoy! I'd love to hear your thoughts! 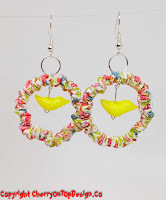 I'm a sweet and swanky girl who has discovered a passion for making handmade, custom and one of a kind jewelry! Who knew? !